What's the best comfort height toilet? Sometimes, regular daily activities can present handicapped people with tough challenges. Things like climbing up stairs, getting into cars and not least, using toilets. This presented many companies with a chance to target a market that wasn’t having their needs met, as well as giving them an opportunity to do some good and really help people. In this article, we’ll be talking about comfort height toilets. ​What is a Comfort Height Toilet? As you might have guessed from our preface, comfort height toilets are designed for people with handicaps to use. We’re going to review three different comfort height toilets, also known as tall toilets, and then give our recommendation in the end. So without further ado, we present to you the 3 best comfort toilets for the handicapped and elderly. 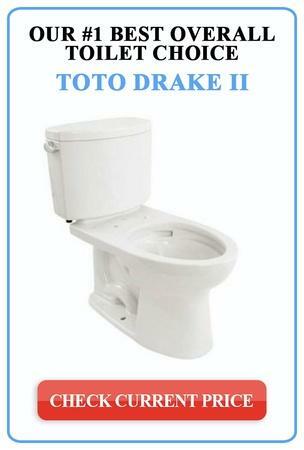 The Toto Drake II is a worthy addition to any toilet. Toto is generally known for its reliable, durable products, as well as their attention to detail and commitment to innovation. This unit’s consumption of water is lower than average, it is available in a series of different colors and comes with an attractive chrome finish. 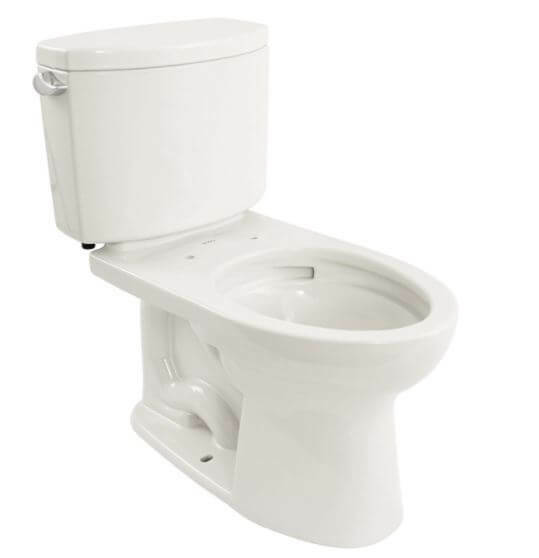 The toilet bowl is elongated, rather than round, making for more comfortable seating. And of course, most importantly, this toilet is ADA-compliant (the ADA is the Americans with Disabilities Act), meaning it is undoubtedly more convenient for those with limited mobility to use. Perhaps the one disadvantage we can point out of buying the Toto Drake II is the fact that is more expensive than other alternatives, but the quality is quite undeniable, so it’s not like it’s for nothing. Made by the ever-reliable American Standard, this unit is efficient as much as it is effective. It features an extra-wide, chemical resistant flush valve that allows for more water to enter the bowl, resulting in a cleaner flush. This unit also features an EverClean surface, which resists the buildup of mold and mildew, and is easier to clean. Again, this toilet is ADA-compliant, which makes it an attractive option for anyone who faces issues using standard issue toilets. On the other hand, there seem to be a fair share of complaints from people regarding the plastic used to make the seat. At best, it was described as flimsy and cheap. This, coupled with the fact that replacement parts tend to be quite pricey, means that you should probably do some more research or maybe even go have a look at it yourself before making the purchase. Kohler is one of the finest toilet manufacturers in the market currently, so it shouldn’t come as a surprise that it features as one of the three products we are reviewing. This unit has innovative technology that allows water to enter the bowl from 360 degrees, allowing for smoother and more consistent water flow which ultimately leads to a cleaner flush. In addition, seals within the unit resist leaks, tears and shrinkage. The elongated seat allows for a comfortable seat and of course, the unit complies with the ADA’s regulations. However, at 1.6 GPF (gallons per flush), the Kohler K-375-0 Kelston consumes more water than some of its other counterparts, docking some points off what is an otherwise fantastic, reliable unit. Okay, so we’ve been talking about and comparing different comfort height toilets (or tall toilets), but what exactly are they? And how are they different than standard issue toilets? 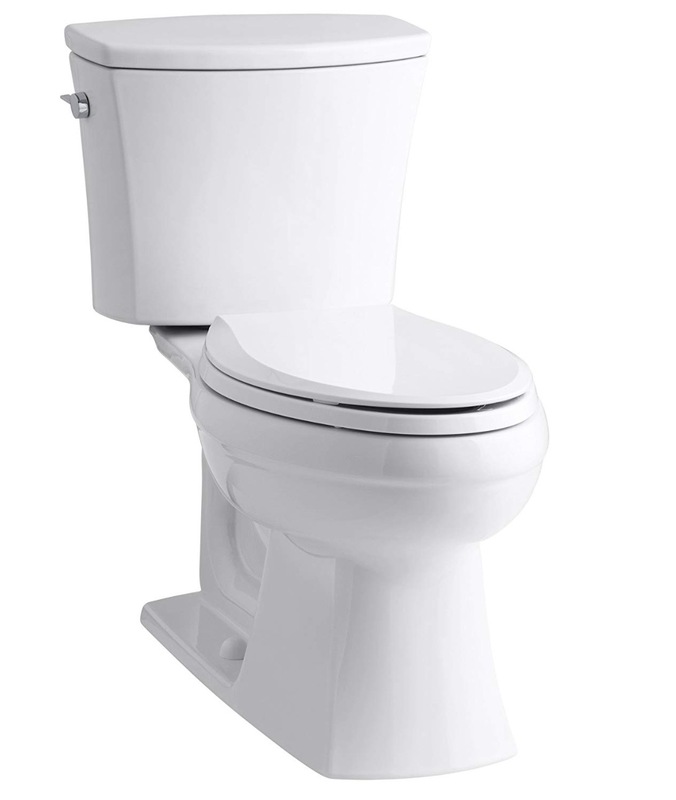 A comfort height toilet is 17 to 19 inches from the ground to the seat, around the height of a regular chair. In contrast, a standard issue toilet is traditionally 15 inches from the ground to the seat. 17 to 19 inches is the acceptable range for any toilet to be ADA-compliant, and has been found to be easier to use by people who have physical disabilities, as well as the elderly. 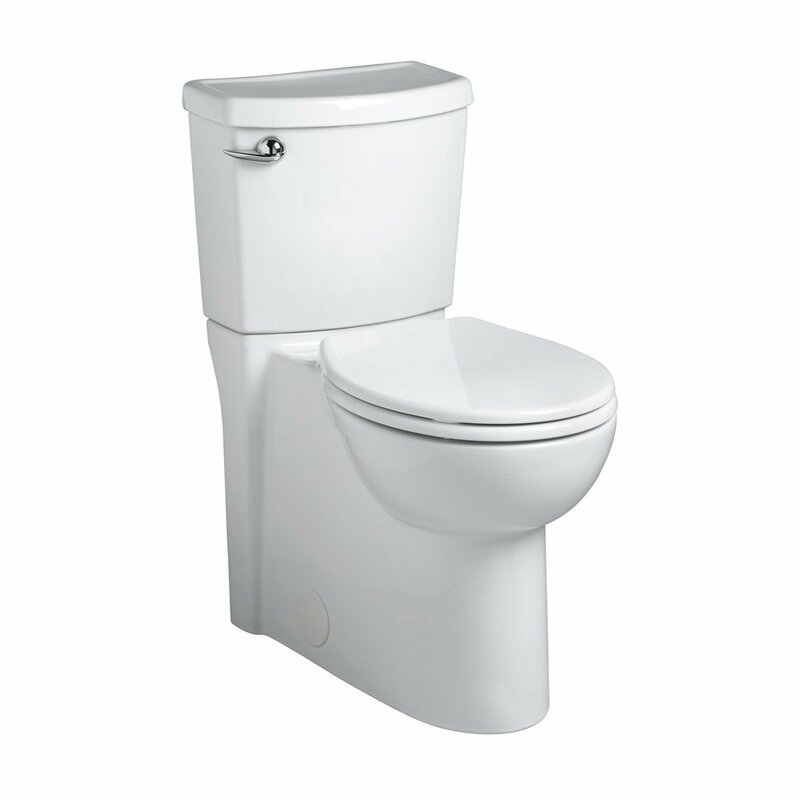 Besides the height, tall toilets are pretty much the same as regular toilets, in terms of installation. Of course, you are advised to seek the help of a professional plumber, as even tiny problems with installation can have severe and putrid consequences. Connections between the tank and the bowl must be secure and tight, and all water connections must be leak-free. 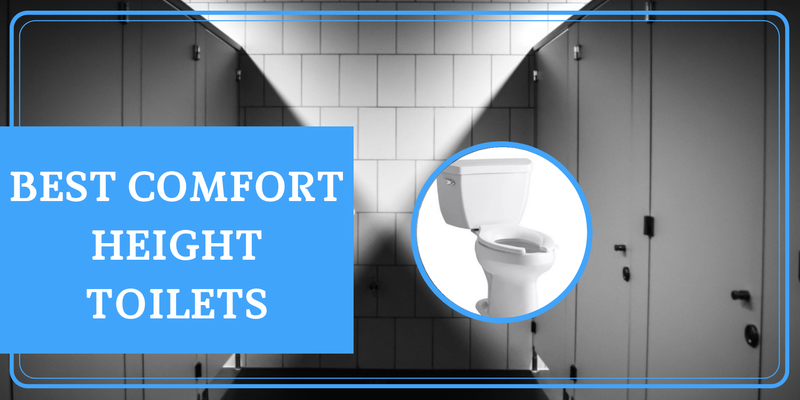 The benefits of comfort height toilets become especially clear if you regularly interact with someone with physical disabilities, or if you yourself have physical disabilities. Seat height - The seat is higher off the ground, making it easier to pass on and off the toilet and to ensure that sit-down and stand-up postures are straightforward. For tall and elderly people - The additional height makes it an ideal toilet seat for the elderly, anyone with back pains or generally anyone with joint pains, hip problems and arthritis. They are also perfect for tall people. Flushing - Another, less obvious benefit of tall toilets is the fact they are often engineered to be more effective at flushing out waste, using less water. The lower rate of clogging could make this type of toilet worth buying. Like we mentioned, all three toilets are pretty worthy investments to add to your home. Toto, Kohler and American Standard are three of the best in the business. That being said, if we had to choose one, we would certainly go for the Toto Drake II. Superior performance, less frequent maintenance, innovation and fantastic quality all make the Toto Drake II pretty difficult to beat. But by all means, feel free to do your own research and try out the units for yourself.